another minibus will be waiting for you; to bring you to the balloons. I am sure, it will be an unforgetable experience! When I was there, we had not much wind and did not get far. 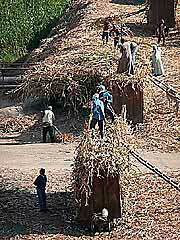 But Linda sent me beautiful pictures (small pics left and right side), which show, if you are lucky, you will even cross the Nile. 1 balloon is for 20 to 25 people. After the trip you will be brought back o your hotel. 5.30 - 6.15 - 7.00 a.m.
P.S. Thank you Linda for the pictures, and of course they are her copyright! 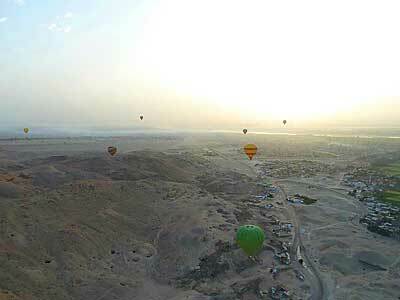 "Waleed got us a great deal on the balloon ride at 500 EGP per person in Luxor. We found out that another couple on our boat paid $120 US per person each so we know we got a great deal. We never told them what we paid ;) "
P.S. 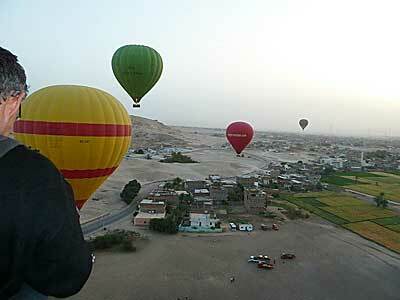 Due to changes asked from the government the companies for riding hot air balloons have raised the prices several times since 2012, which is why it is 80 USD now.